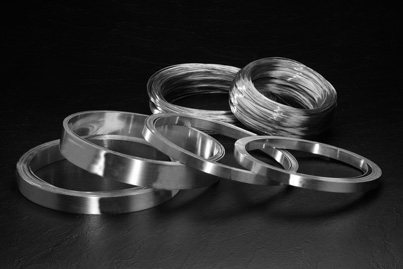 Reliable Corporation fabricates fine silver wire, strip, and rods from 99.99 percent pure silver to customer-specified dimensions, mechanical properties, and composition. Alloys requiring copper are manufactured with only OFHC pure copper. We use proprietary processes and techniques to produce material of precise and uniform grain structure to ensure consistent physical properties throughout your product. Reliable’s custom wire, strip, and rod will perform in your most demanding machining and forming processes. State of the art in-house laboratory equipment helps ensure your custom order is always on spec. Our quality control processes are certified to ISO 9001:2008 and are regularly reviewed as part of our continuous improvement program. Our goal is to be your trusted supplier, from the time you send us your RFQ through to our customer satisfaction follow-up.